CLIFTON Block-5, 2 bedrooms apartment first floor renovated tiled flooring opposite park boundary wall project line water alert security. CLIFTON Block-5, apartment 3 bedrooms ground floor small residential complex separate enlrance renovated. 5 Beds Apartment 3200 Sq. 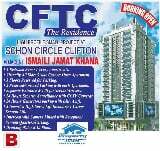 CLIFTON BLOCK-5, 3 bedroom apartment behind Karachi grammar school file flooring American kitchen line water ample parking RIGHT WAY ESTATE.